Easter Monday. The Rabbit has come and gone. Winter is waning. There is enough sun power to bring the temperatures above freezing almost everyday. Snow is melting! And we got lots and lots of it this past season. One more month of "inside" weather. By this time next month, my thoughts and activities will have me poking around the yard, cleaning up and organizing for our short but brilliant summer. Right now, as I observe the in-progress projects and to-do piles that surround me, suddenly there is a comprehensible deadline and if I want to have them out of the way (or at least a good portion of them completed) before the spring breezes beckon me outside, I had better hop to it. So for this months Counterfeit Kit Challenge, I held tight the reigns of restraint. Less to choose from should translate into faster design decisions for me. I hope. I studied the inspiration kit at Gossamer Blue. Followed that with the design team's blog hop leaving greetings and comments in my wake. And then grabbed the drawer of yellow paper and started flipping. Pulling a page or two that resembled the papers in the inspiration photo, I quickly had my eight patterned papers and four cardstocks picked out. Then the alphas, as best I could match. Followed by a selection of embellies. 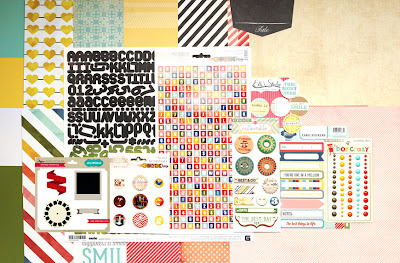 Stickers, chipboard, ribbons, flowers, brads, bling, paper clips, pins and homemade project life cards. It's all in there. 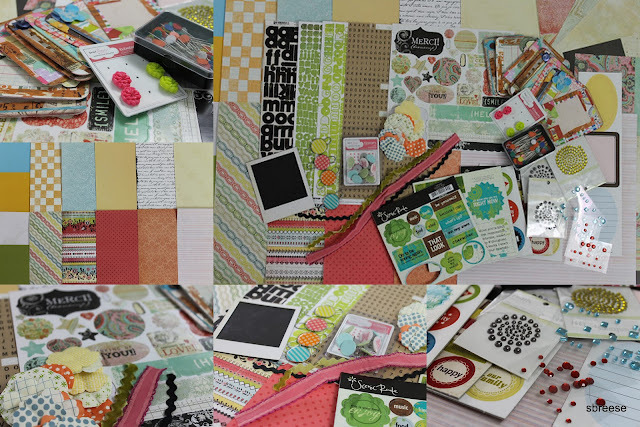 And this is my April kit, named "Hop To It"
I don't have any sheets of journal cards as shown in the inspiration kit so I chose Basic Grey, Urban Prairie, Weather Vane because of it's bright energy. Orange, tone on tone, small print, My Mine's Eye, Lost and Found Two, Rosy "Love"
Had a conversation with my scrappy daughter yesterday. She thinks that if you don't like a piece of paper when you first see it, you shouldn't hang on to it, thinking it may grow on you. You either like it or you don't and if not, you should not hang on to it because you will never use it. I am not sure I can agree with that. Every month, in matching up to the inspiration kit, I pull out papers I would never have choosen if I was just matching up to a photo in hand. And for the most part, they work their way onto a layout. 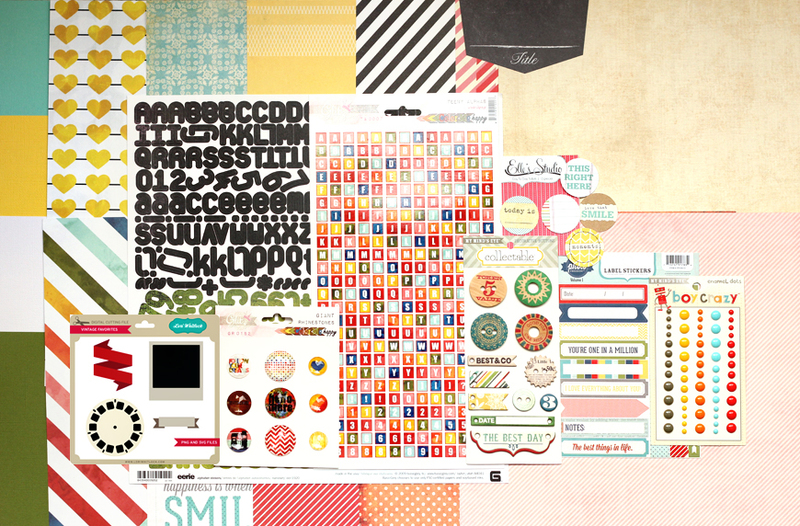 If I was to let go of the papers that just don't "move" me, I would have a lot of anxiety, and worry that next month's inspiration kit would probably need a patterned paper just like the one(s) I was letting go of. On to the fun parts. Bo Bunny, Mama-razzi. There are some photography themed stickers along with the alphas. Also, not shown are the remnants of alphas from Polar Bear Press, and a mini sticker book, cover long gone. These will be in the "use it or loose it" basket. The Poloroid frame is a plastic overlay. I found a couple in a thrift shop one day. Just the sort of thing to tuck in a drawer until you need it to match to a challenge kit. The paper clips were sourced out at Staples. Packaging long since discarded so not sure on brand. I find it hard to incorporate a paperclip onto a layout without it looking (to me) affected. I think I will remove the wires and use the cheerful epoxy-like circles for flair. The paper flowers also are missing their packaging and brand name. The came with a handful of coordinating buttons. I will have to pull them into the fray. Buttons are a staple for me. Buttons and chocolate. I can't scrap without them. Well, maybe I can but I prefer the indulgence. Quilt pins from the sewing shop. I think I declared their providence a few months back when I first used them. Three bits of ribbon, muk. Pink scallop edge, black ric-rac, and VELVET olive ric-rac. They were in a package with three Basic Grey papers. Kind of a mini-kit made by a vendor at a trade show. And at $1 a package, you know I brought home too many. Stickers, from a card kit called Road Shot by Fancy Pants designs. I also added the paper from the card kit. If it doesn't make it onto the layouts, then I will have to make the cards it was meant for. And my ever growing stack of homemade project life cards. Each of them a unique little mini layout. So there it is. My April CKC kit, "Hop To It." What do you think? GREAT KIT, Sassy! Love how fresh and springy it feels! And...I'm a lot like you. I'm much more hesitant to give away paper because I don't like it at first. The CKC blog has helped me to learn to use papers I may have given away in the past. Also, may I say how much I adore your polaroid pieces? Good eye at the thrift store!!! Just now getting a look at this. I have to agree about the paper, altho truly I am due for a purge. I am still enamored of your cunning cards! Such a wonderful instant accent at the ready for your pages. I, too am beginning to look forward to a good window washing, clearing out of the garden beds & restoring of the bird feeding stations - neglected since last summer...we have plans to screen in a large portion of the front porch which will allow the French doors to be thrown open much of the season ahead. I can't wait!